1. While mainstream fizzy drinks go flat, onsite carbonated versions on the rise. 2. Japanese Chairman of Seven Eleven looks to establishing online delivery and pick up points at all stores. 3. Chicago researcher says US store visits plummeted 21% in week before Christmas. 4. ARA says Boxing Day sales exceeded expectations. 5. NAB says Boxing Day card transactions up 25% on last year. 6. 800 Australian Gloria Jean’s coffee shops to be sold to Singaporean food company. 7. Target to pay $1m in settlement of fake MAC cosmetics case. 8. Department store, John Lewis, says 76% of Christmas Day online traffic done on mobile. My niece announced her pregnancy this week by posting a scan of her growing baby on Facebook. The response was “Congratulations!” and “Wow!”. There was a touch of “Wow” about the way the announcement was made but really it made a lot of sense with most of her friends and family communicating on social media. If you analyse the process she was simply using some new technology to make her communication more effective. The analogy with retailing is irresistible. Customers are doing their shopping online and in store. My niece didn’t put all her eggs in one basket by just posting online. She also rang her close friends and used traditional communication as well as new technology. In a sense shoppers are doing the same. Arguments that online and in-store shopping are mutually exclusive just don’t make sense. They are both part of the same process and shoppers will move between the two depending on the nature of their purchase and the circumstances they find themselves in. 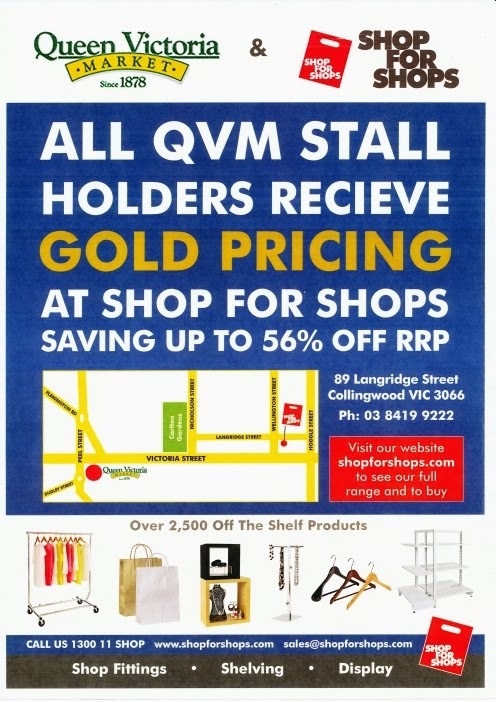 There is a strong argument that face to face retailing like we offer at QVM will stay attractive to customers. There is an equally strong argument that online provides the convenience that shoppers find very desirable, at least at times. Traders must be ready to offer both options if they hope to survive 2014. Monday 23rd December was a special trading day for the top end of QVM. Not all traders took advantage of the opportunity to trade despite the offer of free rent. Basically we were accommodating the market’s decision to open the food areas of the market for the expected last minute Christmas food rush. “I had a really good day” – giftware trader. What was your experience? We would love to hear from other traders. This is the latest mobile PayWave (or PayPass) EFTPOS machine. It is such a leap forward over the older version that all traders should consider up-grading. 1. Convenience – allowing your customer to simply wave their card over the machine to complete a transaction is convenient for both customer and retailer. And it is becoming the norm in retailing. In fact, retailers without PayWave are becoming an annoyance for some (your editor included). 2. Speed – these new machines are much quicker to wake up and to print the receipt. Let’s face it customers shouldn’t have to wait for a simple book-keeping procedure to complete. 3. Charging – this machine comes with a simple charging cradle that links securely with the EFTPOS machine every time. No plugging in of dodgy cables. Simply place on the cradle each night and retrieve before heading off to the market each morning. Basically the machine stays on all the time and there is no waiting for the old log on procedure to take place. Commonwealth Bank charge a $59 one-off fee for up-grading. We think it is money well spent. Should We Trade On Boxing Day? In the lead up to Christmas a number of traders asked the legitimate question – why don’t we trade on Boxing Day? Boxing Day is acknowledged as one of the key retail trading days of the year, particularly because it heralds the start of the post-Christmas sale period. The reason we don’t trade is quite simple. Boxing Day is a nominated non-trading day for QVM along with Christmas Day, New Years Day, Good Friday, Anzac Day, and Melbourne Cup Day. Basically we are operating the way we have for decades and it can be argued that we haven’t kept up with recent retailing trends. family owned businesses operating on the one site. Family businesses have different needs to larger corporations and spending quality time with family members is just one of those needs. In the USA there is a significant public outcry against retailing chains who require their staff to work on key family holidays like Thanksgiving. What do you think? Should we be taking advantage of an important retail trading day? 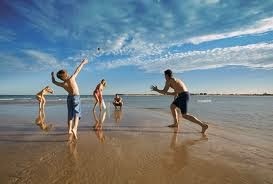 Or should we recognise the importance of having a couple of days of with the family on a significant cultural occasion? The Trader Hub is regularly updated with useful information including a recent link to Small Business Victoria’s marketing plan template for 2014, and some advice on detecting counterfeit currency following the recent spate of fake $50’s in the market. Logging in to the Trader Hub requires your Username and Password. The market has negotiated a special deal for traders with one of Australia’s leading shop supply wholesalers. Shop For Shops in Collingwood is a supplier of all things that retailers need – from shop fittings to accessories, and consumables like paper and plastic bags. The deal is that traders will receive Gold Pricing (Shop For Shops premium discount for bulk purchases) across the whole range even for small quantities. The Gold Pricing discount goes as high as 56% but for commonly purchased items like paper bags is around 30%. Medium paper carry bags, for instance, are reduced from $0.51 each in packs of 20 to $0.36 each with QVM’s discount. To all traders, members of staff, customers, and anybody associated with the Queen Victoria Market we would like to wish you a Merry Christmas. Victraders - Your Trader Representatives. 1. Scoopon ordered to pay penalties of $1 million for false or misleading representations to both businesses and consumers. 2. Amazons German workers strike just days before Christmas. 3. US study says same or next day delivery becoming key driver for retail. 4. McDonalds and KFC under fire for sponsoring kids events. 5. US economy seen as on the improve while A$ declines. 6. Signatures on credit cards to be abolished from July 2014. 7. Footlocker opens first House of Hoops store in Australia with dedication to basketball. 8. Wotif predicts 20% profit decline as Australia and NZ bookings fall. 9. Kitchen & homewares retailer, Robyn’s Kitchen, enters administration. 10. Mainland China's luxury goods market growth has slowed from seven per cent in 2012 to just two per cent in 2013. 11. Japanese fast fashion store, Uniglo, to open pop-up store in Swanston St. late January. 12. Gold Coast’s Pacific Fair shopping centre to commence $670m re-development early 2014. Market Traders Negotiate Compensation During Construction. 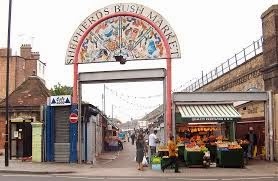 Shepherds Bush Market in the UK is a small market by QVM standards (only 138 stalls) but a recent agreement for compensation to traders during drainage and construction works has a much more important implication for markets worldwide. 1. Works must take place over a minimum of 28 consecutive days. 2. Businesses must have an annual turnover under £500,000. 3. The alleged loss must exceed 2.5% of annual turnover. 4. 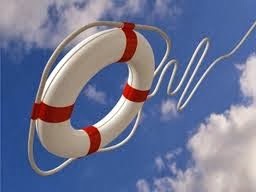 The business must have taken all reasonable measures to mitigate losses during the period. There are also requirements for proof of loss including all accounting records and or taxation records. Ideally any construction period involving a market would have minimal impact but measures like this may be necessary to ensure that everybody agrees what “minimal” really means. There is a notice in the car park advising that parking fees will go up shortly as a result of a congestion tax. The detail is shown below. The tax only applies to the CBD and inner Melbourne so it won’t impact on our competing shopping centres in suburban areas. This is an issue that deserves our close scrutiny but if you want a knee-jerk reaction here is what one of our traders had to say – “Screwed again – so much for government claims of protecting and promoting QVM”. One of the easiest choices was for my nephew's new-born son. He is only a couple of months old and "Pickles" the lamb was an ideal gift. 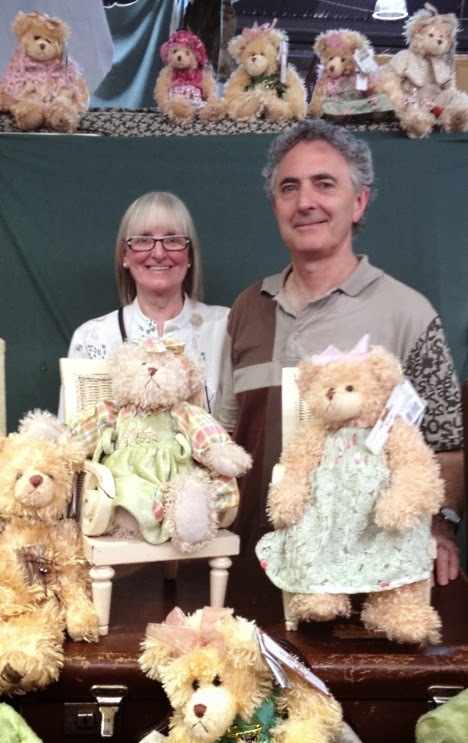 "Pickles" comes from one of the collector ranges at Kevin & Annette Stanisich's Teddy bear stall and is priced at just $25 (half the RRP). It is not easy to see in this photo but the handmade lacquer candle holder held by Giang is just perfect for my niece. The holder is made in Vietnam, supporting local artisans, and cost just $10. Khoa & Giang sell a wide range of attractive lacquer ware at their stall. These colourful wrist ties are ideal for one of my Granddaughter's who is almost a teenager. Her main gift will be a clothing voucher but that's a little boring so a more personal add-on is in order. The 4 wrist ties from Angela were just $10. This useful umbrella is a mini size for easy carrying and features a unique inspirational saying on the umbrella and the little carry case. Just part of the range designed by our own Suzie at Vivant Creations in E shed. Price - $15. This mini masterpiece from photographer Tony Pierrakos is going to one of my nephews who I am sure will appreciate the tranquil scene and the fact that this is a true artisan product. Just $10. Incidentally the shot was taken at Narooma on the NSW coast. My youngest Granddaughter is going to love this umbrella and the little wind-up rabbit if for no other reason than pink is her favourite colour. Both purchased from Lien in RK shed for just $18. My brother is going to love this collection of culinary utensils. From the basic Beech cooking spoon (definitely the best timber for wooden utensils) to the olive pitter and an excellent sharpening steel, all for $20 at Pino's. Now I am not sure who I am giving this ukulele to but it is an excellent little instrument, made of wood, and an absolute bargain for $15. It would be appropriate for young or old or perhaps I will keep it for myself. Thanks to Lim for supplying this item. These are just some of the many presents I obtained in the top end in a morning of shopping. Not only was I able to tick off the majority of items on my gift list but I did it at very reasonable cost and I enjoyed the whole process. 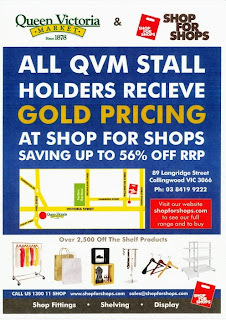 Ok, we are a little biased but this ad strikes all the right chords for QVM fans. Sit back and enjoy. 1. Super Retail Group says Workout World not in administration just re-structuring. 2. Coles & Woolworths agree to reduce discounts on fuel. 3. Flight Centre loses price fixing legal case. 4. Sportscraft launches new store format in Sydney. 5. Louis Vuitton continues store expansion into India. 6. Metcash to split food and groceries into two divisions. 7. Four Harvey Norman franchisees fined for misleading consumers on guarantee laws. 8. Consumer confidence falls 5% in December. 9. Vodafone plans to exit retail stores as sales suffer. 10. ANZ report says Australian retailers sourcing more goods direct from overseas. 11. 7-Eleven to open first store in Vietnam. 12. US study says less than 2% of retail sales in November/December have come directly from social media like Facebook and Pinterest. 13. US fashion icon, American Eagle, prepares assault on UK market. Iconic surfwear company, Billabong, plans a comeback based on “Fewer, bigger, and better”. 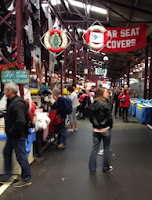 Kevin Stanisich is a 4th generation trader at the Queen Victoria Market. 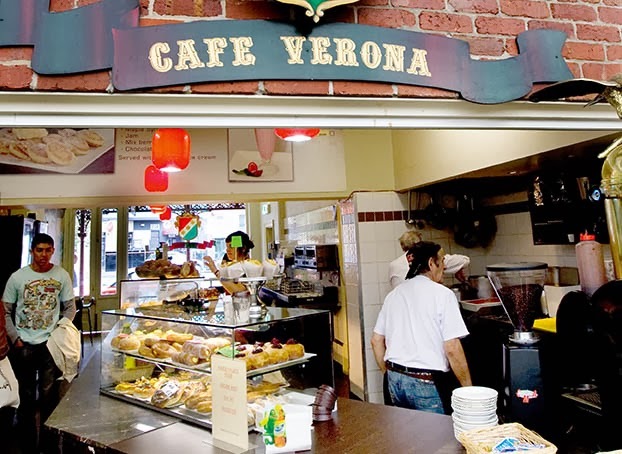 His family has a long history of trading at this Melbourne icon but it is time to move on. Kevin and his wife, Annette, are selling their Teddy Bear stall in J shed. Kevin’s Great Grandfather used to sell spectacles at the market at a time when a horse and cart were parked behind the stall instead of a motor vehicle. Kevin’s Grandfather sold a huge variety of products but mostly related to the rag trade. There were fabrics, furs and laces often bought direct from manufacturers in Flinders Lane. Kevin remembers the excitement of buying a new load of goods, placing it on the stall and then seeing what sold. Leftovers were slowly reduced in price until they did sell and then the whole process started over again. He recalls his Father selling the first lot of Koala souvenirs at the market. They were made locally out of Kangaroo skin. He also recalls the time when the market conducted a car boot sale in L shed. He, and a couple of other traders with a passion for antiques, used to troll the stalls early in the morning looking for treasures. There was usually an element of manufacturing involved in this market business. Kevin’s Mother would make and sell babywear, while in later years Annette would make lamp shades as part of their haberdashery business. At the Lord Mayor’s Commendations for small business in 2012, Kevin received a Platinum Award for 50+ years of service to the City of Melbourne plus a Generational Family Business Commendation. His wife Annette received a Gold Commendation for small business service. Recognition of this sort doesn’t come regularly at QVM. Traders tend to concentrate on daily service to their customers as just part of running a business. There is little room for reflection and indeed Kevin and Annette were reluctant to have information published on this website. It is true that the market is bigger than the trader. Times move on and change is inevitable. But pausing occasionally to recognise outstanding contributions is worthwhile and Kevin and Annette certainly fall into this category. We wish them every success in this new phase of their life and thank them for their service to QVM, its customers and the trader community. Retail centre owners (including the owners of QVM) seem to regard retail concepts as part of a simple evolvement that will take its natural course. CD’s have moved on and online music particularly through mobile phones has moved in. 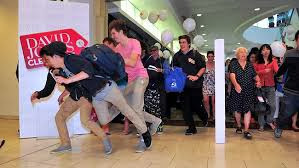 But is this latest trend in retail – what has been described as a “tsunami” of retail decline – just a trend that will take its course or a “call to arms” for a whole new look at how we relate to customers. We need to be careful here because history is full of knee-jerk reactions that in hindsight missed the mark. But let’s abandon clinical analysis for just a moment and express some gut reactions to today’s retailing dilemma. Surely this is more than just concept or category evolution. How can business be so flat at QVM just 8 days before Christmas? How can we have big crowd days that produce small crowd business? Dennis Price has just written an excellent article in Inside Retailing in which he identifies food as the guide to what customers are embracing. We know that statistically food is on the rise. We have seen a proliferation of food outlets at QVM and even the humble food van is experiencing a dramatic rise into gourmet food categorisation in our own String Bean Alley. Customers are embracing variety, choice and innovation. The trick is to translate those factors (Experiental, Co-creation, Personalisation, and Authenticity) into other categories. In fact we could translate them into a whole-of-market view and this is where new traders and innovation by current traders become so important. It is early days, but maybe food is providing us with the guidance we need to stimulate the whole retail feel at QVM. The idea of filling the vacancies in our market with new, exciting traders and concepts was the basic premise of our article headed – Why reduce General Merchandise When There Are More Positive Alternatives? Traders will be pleased to know that we do not appear to be in conflict with management on that point, at least not in the short term. Our CEO assures us that management are working very hard to attract new innovative traders to QVM, to fill the gaps in our product ranges and to make our market more exciting for customers. Who knows? – maybe a combination of new traders, innovation by current traders, and some guidance from the humble food category will steer our path. Here is the second in our Christmas advertising videos. This K-Mart ad doesn't have much class but it did have a big impact when screened in the US. Condolences – Two of our trader family have lost their fathers in recent months. Our condolences to Khoa Nguyen and Ninh Doan and their families. Trader Representative Takes On Research Role – Ivano Guseli has been engaged by QVM and CoM to look into lessons that may be learned from recent renewal processes at South Melbourne, Prahran, Dandenong, Preston and some overseas markets. The impact of renewal on traders will be a prime focus. Engagement of a trader to assist in this type of work is seen as a positive move for all traders as we strive for greater involvement in the decision making process around QVM Renewal. More Buzz Around String Bean Alley – A number of traders have identified increased customer activity in String Bean Alley as the number of stalls, including food vendors, is increased. Other improvements include more seating areas and the provision of garden beds. Peel St Parking – Traders are reminded that kerbside parking at the top of J, K and L sheds is intended for tourist buses. Tourist disembarkation at the top of the market as seen as an important source of business for all traders. Traders are asked to complete unloading on Peel St. as early as possible each morning and then leave this area clear for buses. Why Reduce General Merchandise When There Are More Positive Alternatives? Many traders are concerned at reducing the size of the General Merchandise area of our market and with good reason. Reducing the number of stalls during tough times is seen as a knee jerk reaction that if applied during previous tough times (and there have been many of those) would have been regretted. The difficulty is that we don't really know how this latest downturn will play out. Is it just a short term downturn or is it a permanent change brought about by new consumer attitudes to retailing? 1. Rent reduction for the first 3 months. 2. Flexible trading periods. Many would-be-traders, particularly artisans, choose to work particular seasons. It suits their product range and their lifestyle. 3. Assistance with displays, installation, and weather protection. 4. No license lock-ins. Like we said - be flexible. 5. Offer marketing and promotional assistance. Our proponent suggests the opportunity could be advertised through the QVM website and the Traders Hub (A trader's circle of family members and business associates could be a rich source of applicants). He also suggests that this is not a gravy train. If the new trader can't handle full rent after 3 months they should move on and perhaps come back next year. We like the idea. Being positive and creative beats the hell out of taking a backward step. But how realistic is this proposal? Is there really a pool of potential traders out there just waiting to be enticed to a place like QVM? Traders are leaving the market faster than we can replace them. We do know that the QVM recruiting staff are increasing their efforts to find suitable traders. Are they providing the right incentives? These are questions we will be asking our CEO. Stay tuned. 06/12/2013 18:21:56 Reducing market size "This is a great article, it would be easy to roll over and say that retail is tough, let's make it easier and reduce the size, but that will make it easier for who ? The reality is that running a business isn't easier, there are good times bad times. we have to adjust to tough times. If you want to start work at 9, have everything in a nice little lockup shop, walk out at 3.30 then market life isn't for you,if you want things handed to you on a platter, then running a business isn't for you either. All the hard work that comes from running a stall at the Queen Victoria Market is a lifestyle choice." 07/12/2013 09:16:18 Why reduce general merchandise "I agree. We should concentrate on filling the market so that the market will look more attractive." 10/12/2013 08:58:31 Why You Need To Reduce? "Peter Rand has hit the nail on the head. Reducing the size will reduce the appeal, custom and eventually the end." 1. Online buying club, Ozsales, enters multi-million dollar logistics partnership with Australia Post. 2. European menswear brand, Jack & Jones, opens store in India. 3. Japanese variety retailer, Daiso, plans flagship store in Melbourne CBD. 4. Courier businesses expected to grow as E-commerce booms. 5. ACCC cracks down on fake on-line reviews. 6. QBD Bookshop says strong online presence helps in-store sales. 7. Dutch supermarket smashes convention by grouping produce according to recipes. 8. L’Oreal abandons its direct marketing catalogues in France, Germany and Japan following weak trends in direct catalogue model. 9. Coles and Woolworths said to be close to agreement with ACCC on paring back their petrol discount voucher schemes. 10. Beijing online shoppers spent $10.6 billion during the first 9 months of the year. 11. Topshop opens largest Australian store in Brisbane. 12. Workout World placed into administration. 13. Westfield takes ownership of New York’s World Trade Centre shopping mall. 14. Fairwork Australia launches new phone advisory service for small business. 15. Online fashion retailer, The Iconic, receives fresh $20m funding from parent company. We are going to publish some of our favourite Christmas video advertisements over the next couple of weeks. They have been sourced globally and will range from a rather crass K-mart boxer shorts ad to a wonderful mini animated cartoon from the UK's John Lewis. But first up is a clever ad from Harvey Nicholls, the high end British department store. Enjoy! Coles have opened three new concept supermarkets in Sydney following a successful trial at Southland in Melbourne. 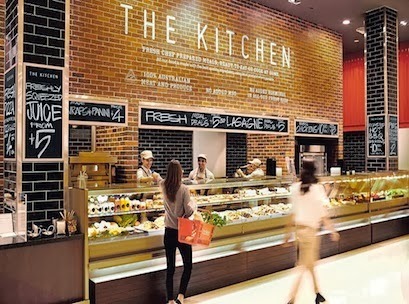 The new look stores feature a Coles Kitchen that allows shoppers to select from a range of freshly prepared takeaway options, such as freshly sandwiches and baguettes, sushi, and hot and cold pizzas, and pies. A barista quality coffee bar is included as well as a patisserie sourcing local baked cakes and pastries. Both Cole and Woolworths have aimed their marketing at “market freshness” and these latest innovations from Coles show that they are not resting on their laurels. The competition between these two supermarket giants is driving significant improvements in customer experience and the losers may simply be the food providers on the outside who fail to step up to the challenge. QVM has all these ingredients and offers a superior experience but the gap is narrowing. Opportunities for QVM like on-site cooking and selling of our wonderful fresh meat, fish and deli offerings has been suggested as the next step in enhancing the food experience for our customers. Certainly we need some innovative ideas to stay ahead of the competition. 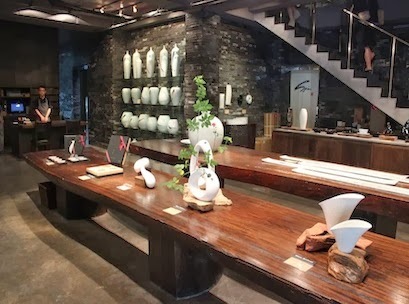 Shanghai ceramic designer and manufacturer, Spin, has credited their success in retailing to “Mm Mm Wah”. In a country with a grand tradition in ceramic manufacture the founder of this enterprise was very disappointed to find that Chinese manufacturers had become good at copying but had lost the talent for innovative and inexpensive ceramic manufacturing. Through hard work and perseverance, Spin manage to find three key local manufacturers to meet their standards and business has risen 10 fold. Thanks to Inside Retailing for this story. Australia’s economic growth in the 3 months to September came in at 0.6%, slightly below the expected 0.7% and below the June quarter growth figure. As a result annual growth slowed to 2.3% which is below the trend rate of 3.25%. Exports contributed 0.7% to growth, with Government investment adding 1.3% while private business investment detracted 1.4% from growth and business inventories a further 0.5% subtraction. The Governor of the Reserve Bank said that the sub-trend growth was expected to continue and that the A$ remained “uncomfortably high”. October retail sales in Australia rose 0.5% in October, slightly above expectations, and 3.6% above October 2012. In the US house prices appear to be on the rise and economic activity is improving although largely on the back of increased inventories in preparation for the holiday period. The US economy is showing growth at a speedy 3.6% with inventory investment contributing 1.7%. It's official - The Age is reporting that cafés, restaurants, food-to-go, and pubs now outnumber shops in the CBD of Melbourne. The statistics were taken from CoM land use data in 2012. Food venue numbers were up 7% from 2010 while shops declined by 3%. The same trend has been identified in Southbank, North Melbourne, and Carlton while Docklands bucked the trend with 21 extra shops. There are 135 more food venues than shops in the CBD as discretionary retailers like clothing and footwear leave and are replaced by food. This is part of a worldwide trend that is fueled at least partly by higher city-centre residency. 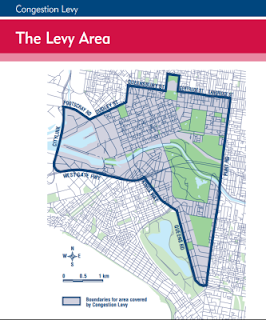 Will QVM Renewal Plans Include A Drone Launching Pad? Retail delivery services have received a huge impetuous from the growth of online business and organisations like Amazon are suggesting that yesterday's fantasy movies are fast approaching reality with the possible use of drones to deliver goods to customers. A recent 60 Minutes show in the US showed how drones could deliver smaller parcels direct to customers homes within a 15k radius of an Amazon warehouse. There are a few little things like legal issues to get over. Drone flights are currently limited to line of sight operation in most parts of the world but many jurisdictions are in the process of framing laws that allow more commercial use of drones. Following is a video showing Amazon's concept in action. 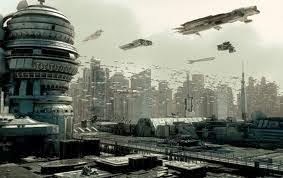 Those movie visions of space ship highways above futuristic cities may just become a reality. QVM renewal strategists take note. 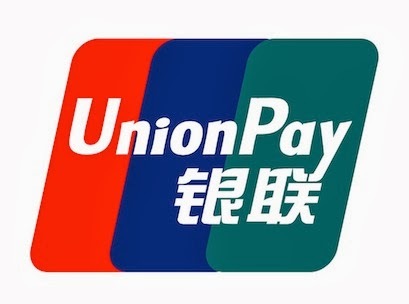 Union Pay is the preferred credit card used by Chinese tourists. An official from the Commonwealth Bank has advised us that most of their mobile EFTPOS machines should have been updated to accept Union Pay by now. A word of warning – the Commonwealth Bank’s charge rate for Union Pay is 2.6%. That is a significant impost compared with the standard 1% charge rate and may influence your ability to bargain with Union Pay card users. 1. The Athlete’s Foot Australia, has acquired the local arm of footwear wholesaler and manufacturer, Saucony, and sporting goods chain, Podium Sports. 2. 40% of David Jones shareholders express anger at Board performance with “No” vote on remuneration. 3. “Diabolical” NSW Retail Leases Act to be reviewed. 4. Jetset Travelworld changes its name to HelloWorld. 5. Jamie Oliver to open fourth restaurant in Australia. 6. Japanese convenience store Circle K to open 500 stores in Malaysia. 7. Perth to extend Sunday retail trading hours in lead up to Christmas. 8. Japanese lifestyle brand, Muji, opens first Australian store at Chadstone. 9. Chanel has opened its first Espace Parfum concept, outside its own boutiques, at David Jones. 10. McDonalds trialling build-your-own burgers using in-store iPads. 11. Woolworths defends slow start for Masters chain. 12. Harvey Norman says federal election failed to stimulate retail so relying on Christmas. 13. World’s largest Sunglasses Hut store opens in George St. Sydney. 14. Apple opens its fourth store in Beijing. 15. Colliers report retail rents falling and landlord’s incentives rising as retail downturn bites. 16. State Treasurers agree GST threshold on overseas purchases needs to be reduced. 17. Permanent food market planned for new city precinct in Perth. 18. Online marketplace, Etsy, opens first pop-up store in Sydney. 19. 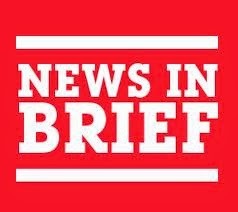 Specialty Fashion Group’s purchase of Rivers described as bargain. 20. Perth bans smoking in city malls. 21. Hugo Boss reports weak sales in China. 1. Black Friday online sales up 20%. 2. Online sales via mobiles at 7.2% of all online sales while tablets took 14.4%. 3. Average spend by tablet users US$132.75. 4. Top 3 items on Target’s Black Friday sales list are all iPads. 5. Average sale from Pinterest referrals double Facebook referrals. The following video has been launched by CoM and gives some insight into consultation for the renewal process. 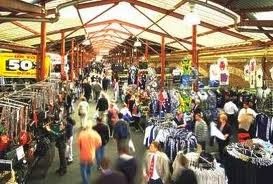 There is a certain synergy about The Queen Victoria Market taking advice from The “Queen of Shops”. 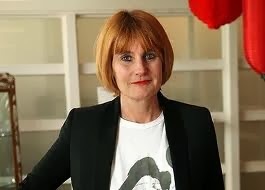 Mary Portas is a retail guru from the UK. In 2011 she was commissioned by the UK Prime Minister to report on "The Future of The High Street" and has since followed up with a TV series entitled "Mary, Queen of Shops". Mary visited Melbourne last month as part of the Victorian Support Small Business Day and left behind her 11 top tips for small business. 1.You have an advantage over your bigger competitors. Chances are you know your customers personally. Ask yourself what you could be doing to help them more. Do you provide exactly what they want or (be objective) could you do things better from their point of view? What could you do that they’d be prepared to pay extra for? (20 percent of your customers will be prepared to pay more). 2.Are you and your staff happy people? Are you a pleasure to do business with? Only ever hire happy people. You can train them in any skill, but you’ll never teach a miserable person to welcome somebody to your business. Don’t compromise – good enough is not enough. 3.Is what you sell and the way you present it the best you can do? Look at what your competitors do. Research online to see how people do it in other countries and ‘copy with pride’. Why can’t you be the best fish shop/plumber/taxi firm/accountant in the world? 4.Get a proper logo, DO NOT DO IT YOURSELF OR USE ‘A FRIEND’. Have your stuff designed by good people. If you don’t have one locally then use Design Crowd online – very easy, cost effective and great results. Take a real pride in how your business presents itself. 5.Don’t be afraid of the web. Used well it’ll bring you loads of business. Use social media wisely, have a great looking website, use Google Express to cheaply get better SEO results. 6.What data do you have? Addresses, e-mails, birthdays? Corporations call it ‘big data’ – for you it’s a way of keeping in touch and keeping your business in front of them. 7.Do your customers know everything you do? Don’t assume that because they know you’re good at one thing, they’ll know all the other things you do. Ask yourself – have you told? Have you sold? 89 percent of new customers are with you because they had a bad experience with a competitor. Would it be useful to talk to people, find out what that experience was and make sure your business won’t make the same mistake? 8.Be thoughtful about the people specifying your service. The Office Manager ordering an executive lunch from your catering business would probably appreciate an additional little bento box on the side just for them with your compliments. 9.Be generous with your skills. A window cleaner in London who posted two minute videos on YouTube explaining the tips of the trade saw his business double. Remember, chances are you have a very small share of the potential market you could reach so of course, giving away tips might reduce the total number of people in need of your service, but there are always more who appreciate the advice and who’ll share it with mates and still won’t have time to clean their own windows. 10.Make it easy for people to recommend you. Give them some cards or something simple like a pencil or printed post-it notes so they can pass your details on to their friends. 11.Be bold and take risks. The dangerous thing to do is play it safe. If they ask you for 10, do 11. 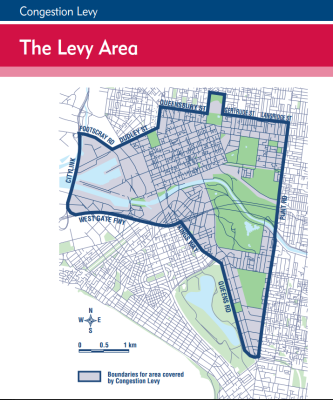 Tuesday’s Queen Victoria Marketing Advisory Committee meeting contained a number of firsts. 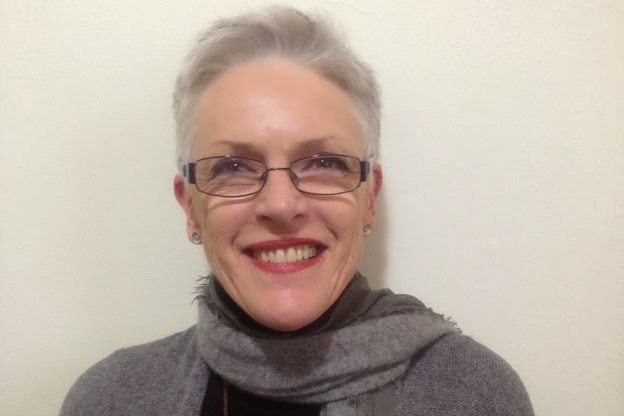 It was the first meeting chaired by our new CEO, Jan Cochrane-Harry, the first attended by two members of the QVM Board, Caroline Parker and Paul Sheahan, and the first since the renewal announcement. . Eight Trader Representatives attended the meeting which opened up a new era in Trader/Management/Board relations. One of the key issues raised by traders concerned marketing expenditure. The question was asked – “Is the current marketing expenditure at QVM sufficient to meet the needs of a major retail entity?" (see separate article below). This issue is to be examined in more detail following the appointment of a new Director of Marketing this week. One of our Trader representatives made a presentation on the impact of shrinking wholesale and manufacturing sectors in Australia, how that affects QVM Traders, and what assistance can be provided by CoM, State Government, and other relevant bodies to guide traders in finding new sources of supply. This is one of the most important challenges facing public retail markets worldwide. 1. Progress on the lighting fitout in the top end. 2. The new loading bay arrangements in Queen St.
3. Trader’s vehicles occupying customer parking spaces in Queen St.
4. Procedures for recruiting and approving new traders. 6. Progress on installing wi-fi throughout the market. 7. The latest figures on tourist visitations to QVM. 8. A review of the casual trader stall allocation process. 9. A guidance manual for new traders. 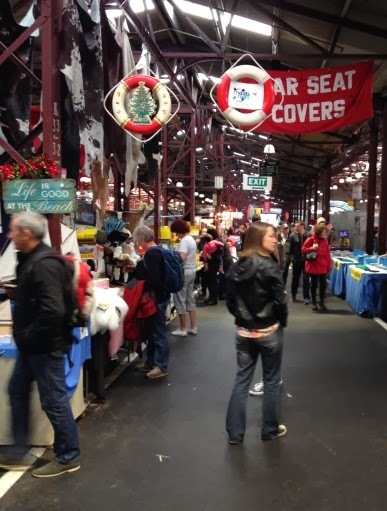 The Queen Victoria Market Advisory Committee (QVMAC) has been operating since at least the 1990’s with varying degrees of success. It is fair to say that today’s re-vamped version, particularly with direct Board access, gives traders their best opportunity in a long while to have greater input into the direction of our wonderful market and ensure that the interests of traders receive appropriate consideration. A major point of discussion at this week’s QVMAC meeting was the level of marketing and promotion at QVM and whether expenditure on this critical function reaches industry standards and is sufficient for a major retail entity. In other words, how much should we be spending on marketing at QVM to do justice to the combined sales potential of all traders. What is the industry standard? A Bloomberg article back in 2009 suggested that, in the retail industry, around 5% of sales turnover should be spent on advertising. A more recent study by Gartners in the US suggested that the average total marketing spend (that is the total spend on marketing including the cost of operating a marketing department) was around 10% for retail. So how does QVM fit into this? Traders do not report sales figures so getting a handle on QVM's sales is not easy. Back in 2008 our CEO famously suggested that QVM turnover was around $1billion per annum, although that was based on an average customer spend taken from some market research multiplied by the number of visitors to QVM (10 million per annum). The figure is probably optimistic but even if we allow for half, $500 million per annum turnover, then around $25m per year needs to be spent on advertising at QVM. Once again, it is difficult to measure what is spent on advertising. 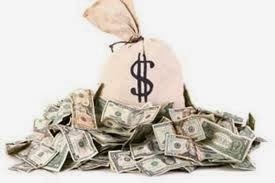 The spend by QVM, the company, is not too difficult to work out, but the spend by traders is unknown? Some traders have substantial marketing budgets, while others spend very little. It is fair to suggest that the combined total gets nowhere near $25 million. In an industry where our competitors are spending huge amounts on marketing (just look at our two competing supermarkets) QVM would appear to be falling behind. This is a common failing of public retail markets around the world. Traders do have some responsibility for marketing their own businesses. Establishing and maintaining a website is probably the main component and embracing social media is certainly a cost effective way of promotion. Many traders have websites and many more need to establish them. But what about other forms of advertising, and is individual business expenditure the best way to market QVM? There is a strong argument for saying that pooled marketing resources is the best way to go. You are more likely to create ripples in a pond with a stream of water than with thousands of individual drops. There is also an argument that traders are already contributing to QVM marketing in their rent. Apparently a number of years ago the market collected a rent figure and a separate advertising levy which were eventually combined into one. Despite this many traders understand that a combined Trader/QVM marketing effort is necessary. A number of traders have already expressed a willingness to contribute to special marketing and promotion funds that, as an example, would bring tourist buses to the market. There are many options to look at, but one thing is sure - both management and traders need to lift their contribution if QVM is to get the level of marketing it deserves and our market is to prosper in today’s competitive retail environment.